Stylish, contemporary decor awaits you in this historic, Grade II listed former coaching Inn, which is under new ownership. 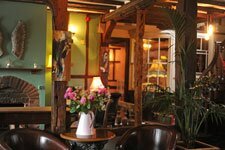 At The Crown you'll find beautiful local artwork, sumptuous fabrics and antique furniture combined with a warm and friendly welcome, local beers and great food. 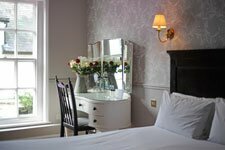 This Inn offers 14 individual rooms, all ensuite and all furnished to the highest standards, with free Wi-Fi, Freeview TV, hairdryer and phone, plus coffee & tea-making facilities. The rooms are all fully-renovated rooms and feature comfortable beds, crisp cotton linen and products from The White Company. From romantic hideaways with designer wallpaper to family suites with ample space, every one of our 14 hotel rooms oozes original style and comfort. 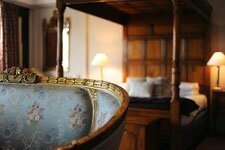 Choose from four feature rooms, all full of character, one family room, one stunning suite, two twin rooms overlooking the courtyard, five spacious double rooms, and one peaceful single room. In addition to these comfortable bedrooms, Framlingham’s finest Inn also offers a restaurant serving mouth-wateringly fine English cuisine as well as a bar serving delicious local ales and fantastic wines. Our Head Chef would be delighted to prepare a meal for you, whether you fancy a bar snack or a 3 course meal. We source food locally where possible, including rare-breed meats from local farmers. Special diets are easily accommodated. For more informal dining, guests are welcome to eat in the courtyard, bar and clock room. Framlingham is an attractive Suffolk town with a magnificent Castle, run by English Heritage, and is only 10 miles to the Suffolk Coast. So it is an excellent base for exploring this part of East Anglia, and the Crown is an excellent base within Framlingham!